My Rehab Connection gives you the ability to create you own exercise groups/templates. To create a new group go to the MY Exercises section then open the exercise you want to add to the group. If you want to add an exercise from the global exercise library you first need to copy it the exercise to your MY Exercises section. The exercise widow will now be displayed. Click on the “Exercise Groups” tab located towards the upper right side of the window. To create a new exercise group simply type the name of the group/template you wish into the to the “Create (ad assign to) new group” field and click “+Add”. 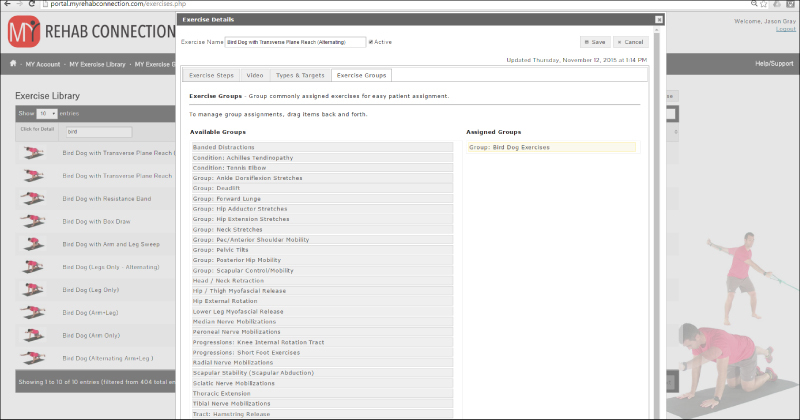 You will now see the exercise group/template you just created in the Assigned Groups column. Note: To remove an exercise from an exercise group drag the exercise group from the “Assigned Groups” column to the “Available Groups” column.